General Staff Chief Nikolay Makarov spoke at length to the press yesterday. In no particular order, here are some of the impressions and reports that followed in his wake. RBCdaily quoted Makarov on the possible Mistral purchase: “Ships of the Mistral type have very great multifunctionality, and they surpass our ships in all parameters by three times.” He went on to say that Russian shipbuilders would only be able to produce helicopter carriers of this quality in 5-10 years. Aleksandr Khramchikhin commented that, in the first place, Russia doesn’t currently have comparable ships and, in the second, it will take 50 years. Makarov said the final decision on buying the Mistral had not been made. According to Rossiyskaya gazeta, Makarov said the Russian Army went to brigades vice divisions to avoid the previous need to flesh out units with reservists and take days to bring them to combat readiness. ‘Modular’ battalions by contrast are permanently ready for battle in an hour. Makarov didn’t rule out establishment of some type of ‘rapid reaction forces,’ though these are closest in nature to today’s VDV. And this wouldn’t mean VDV would simply change its name. And other services need rapid reaction capabilities too for action in the air, on the sea, etc. Aren’t permanently ready brigades rapid reaction forces already? On the Navy headquarters move to St. Petersburg, Makarov claimed Moscow is overflowing with army and navy leadership [but haven’t they just cut 200,000 officers and lots of excess command structures to create a personnel pyramid?]. And with today’s networks the fleet can be commanded from thousands of kilometers away from the Genshtab and other main commands. Makarov doesn’t foresee any change to the one-year conscription policy, but there may be changes in NCO acquisition. Instead of six months training in MD training centers, they may only get 3, so they can serve 9 months in troop units. Makarov thinks they’ll cut back on conscript sergeants once their professional ones start to appear. Moskovskiy komsomolets quoted Makarov on the new strategic arms agreement with the U.S. to the effect that it’s 97 percent complete, and it only remains to agree on the relationship between offensive and defensive weapons, and there will not be anything in the treaty to Russia’s detriment in this regard. On Mistral, Makarov said, after study, we’ve concluded we need this type of ship, which can be an amphibious assault ship, hospital, command ship, and helicopter carrier. On a related note, Makarov said the new Sozvezdiye tactical level command and control system will be part of the netcentric structure toward the end of the year. Gazeta’s coverage focused on Makarov’s comments about establishing the personnel pyramid, i.e. going from armed forces with about 500,000 officers and warrants to one of 150,000 officers and 720,000 soldiers in the space of a year. 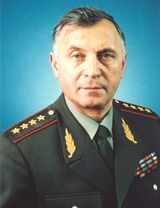 It also noted Makarov’s remark that brigade commanders in their training assembly at the General Staff Academy are learning new warfare and command and control principles. Izvestiya quoted Makarov at length on the Navy Main Staff’s move to Piter. Viktor Baranets in Komsomolskaya pravda focused on Makarov’s words on the U.S. and Iran, noting his statements that the U.S. has a plan to strike Iran, and, if it occurs, it’ll be terrible for Iran, the region, and the U.S.
Krasnaya zvezda covered the Iran issue. It noted that Russia’s need for ready units forced the shift to brigades. It also covered Makarov’s comment that the Voronezh conference agreed on changes needed in the Sozvezdiye C2 system, and that it would be received this July and fielded in November. KZ also quoted Makarov at length on the capabilities of the 5th generation fighter aircraft. KZ also indicated that Makarov noted the U.S. as an example where units and commands are often separated by great distances when he talked about the Navy Main Staff and Piter. Generally, it seems those invited to this press availability only asked Makarov ‘soft ball’ questions. This entry was posted in Command and Control, Manpower, Naval Modernization, Serdyukov's Reforms, VDV and tagged Aleksandr Khramchikhin, Iran, Mistral, Navy Main Staff, Nikolay Makarov, PAK FA, Sozvezdiye. Bookmark the permalink.